Shakely, Jack – The Lighthorsemen – Strider Nolan Media, Inc. In the twilight years of Indian Territory, young mixed-blood Edward Perryman realizes his dream of becoming a member of the Lighthorsemen, the Creek police. These romantic knights of the prairie face cattle rustlers, bootleggers, and thieves, only to be stalked by a distant foe—the United States Congress. Edward transitions from lawman to lawyer as he seeks to protect the Five Civilized Tribes from the Congressional Dawes Act. He is tasked with finding a way to protect Oklahoma’s Indian tribes from a U.S. government set on doing what it thinks is best for cultures it cannot understand. 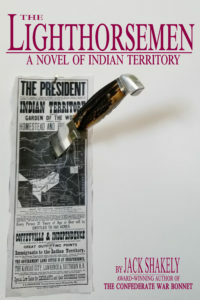 In this coming-of-age novel, as he tries to help his people, Edward struggles with his identity: can he successfully straddle the worlds of Indian and white man? Meanwhile, after the U.S. Government dissolves the Lighthorsemen, one of Edward’s fellow officers does not find the same success at fitting in. A different side of the same coin, the man named Chitto Harjo struggles with his own identity as he regretfully turns to violence in the service of what he believes to be a good cause.